But the project is really about real historical precolonial African nations, and I have tried to form a map of the most prominent of those that existed between the 15th and mid 19th century, by looking at historical maps like the one found in UNESCO’s “A General History of Africa”, linguistic regions and natural boundaries. I have also made a Prezi presentation in which I explain the map and some historical facts, and also the process of making it. This can be seen here. For more versions of the map and details about price, shipping and to order one, click here. Wow, look how incredibly divisive Africa would be. No wonder they were 15,000 years behind before Arabic and European colonization. Most of Africa by the 1800s still hadn’t developed the wheel, or agriculture, or fixed settlements. The only remotely advanced states in Africa at the dawn of European colonization were those that had been colonized by Arabic states. This is an exaggeration. Most of the African population lived in fixed settlements and practiced agriculture. As an African living in Africa, I can tell you first-hand that the careless merging of a lot of these civilisations by colonisers is one of the main reasons we have problems today on the continent e.g. tribalism and nepotism. I recommend you watch the PBS documentary series ‘Africa’s Great Civilizations’. The documentary debunks a lot of theories about Africa being less developed than Europe and Asia. Have a great day. Interesting. You don’t consider the Arab presence that leads to Misr and al-Magrib to be colonization as well? Portugal and Spain remain colonized and occupied. That’s a problem. If Portugal and Spain are colonized and occupied, then so is the whole of Northern Africa. More so, since the “colonizers” of Spain and Portugal were the former inhabitants before they reconquered Spain and Portugal. this map is a commendable effort but is problematic. the western concept of borders aside, many of the ‘countries’ wouldn’t have existed without the pressure of colonialism. the british helped establish Umbuso weSwatini (Swaziland), and the Lesotho analogue (Basuto) in your map was established as a direct result of Zulu expansionism, which itself was partially effected by British and Boer activity in the region. also, it’s unlikely that the Khoe would have been interested in founding Hoeri Kwaggo (Cape Town) – the very idea of sedentary populations was anathema to their mode of production – or that they would even have survived Nguni aggression for much longer. i do love these kinds of maps though and would love to see increasingly accurate representations of what might have been. they fire the imagination and offer us a glimpse of how we might be able to resolve some of the colonial-legacy border issues in Africa. 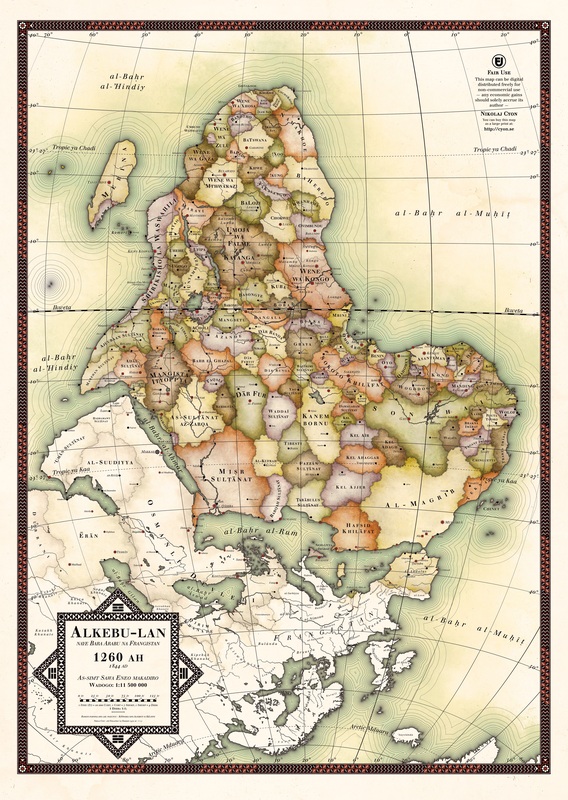 Why does a map of what is supposed to be Africa without colonies has Spain and Sicily under Arab rule and the Ottomans still controlling the Balkans? Do you consider these lands to be somehow colonized by Europeans? So what is the, or an, African Name, for the continent, Pre-english and arabic naming of same? This is a good post until you consider that all life originated from africa….with that being said. Thanks Nikolaj Cyon for your sterling efforts at presenting an arguably post-Western and alternative view of Afrika (as seen from the ‘inside-out’).